The club controls two stretches of the river Colne, near the Tolpits complex. The one above the road is known as the Plantation, and is the narrower of the two stretches. This produces a wide variety of species, but the chub over 5lb, bream over 5lb and carp over 15lb are the main targets. The most productive approaches tend to involve legering large baits either across or in the near margin, or stalking individual fish using floating baits such as bread. One of the hotspots of this stretch if the actually under the road bridge that marks the lower end of the plantation, Chub and Pike can sometimes be found there as can larger Carp and Bream in the early season. 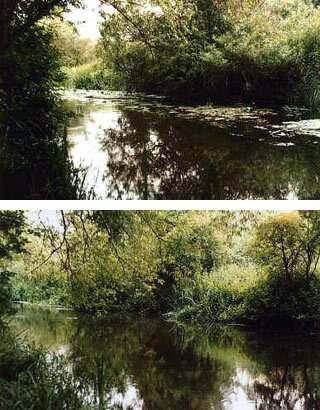 Below the plantation is the second stretch of the Colne known as Ernie′s Patch, at this point the river has widened, deepened and the flow decreased significantly permitting a variety of approaches including float fishing (stick float or waggler) to be employed.